It is my great pleasure to attend this opening ceremony. 137 years ago, in 1877, two Chinese came to London. Both of them are famous in modern Chinese history for different reasons. One of them is my earliest predecessor, Minister Guo Songtao, 59 years of age. He was the beleaguered Qing Dynasty's first resident envoy overseas. The other was the 22-year-old Mr. Yan Fu who came onto these shores as a student. Mr. Guo's brief tenure in the UK saw him making extensive visits to factories and schools. A keen observer of the British system, Guo found the Western strength was not limited to its manufacturing power, but more intrinsically lies in the underpinning studies, systems and ways of thinking. Guo became an avid supporter for the Qing government to learn Western political, economic and social systems. But it made him very unpopular with the still largely conservative bureaucracy at home and led to his dismissal from public office. 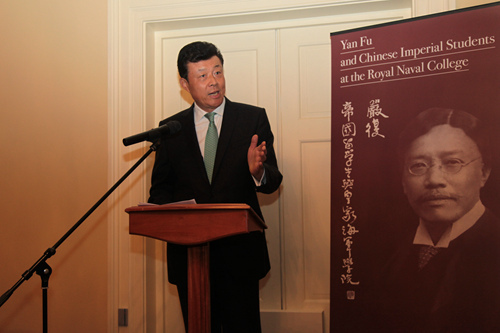 The much younger Yan Fu was sent to the UK to study naval expertise. But his studies ranged far further. He spent most of his time studying Western modern natural and social sciences, and made hard efforts to understand the difference between China and the West, exploring ways towards national prosperity and strength for China. Despite their generational divide, Mr. Guo and Yan Fu built a friendship while they were both living in London. In their conversations they often compared notes on Chinese and Western studies and systems. Mr. Guo was amazed at Yan Fu's talent and insights and the appreciation was returned with gratitude and respect. Yan Fu later referred to Guo Songtao as "the friend who understands me best of all". 27 years later in 1904, Yan Fu returned to London, already an accomplished ‘enlightenment’ thinker. He had translated and introduced in China the Evolution and Ethics, The Wealth of Nations and The Spirit of the Laws among many other works. With his translations and commentaries Yan Fu presented the people of China with insights into European natural, social, and political sciences as well as theories of economics and philosophy. He became a preacher of science and democracy and a supporter of reform and modernisation. A mere 6 years later, the 1911 Revolution that Yan helped to enlighten, and Sun set in motion, put and end to the Qing Dynasty. But as Yan Fu had predicted, the revolution alone did not change China's fortunes for the better. Here we are in London a century later. Imperial China, and British Empire are both no more. Down here in Greenwich much of the Royal Naval College has become the University of Greenwich. But, those larger-than-life figures and their life’s work are as relevant and inspiring as ever. Yan Fu is remembered for his openness and inclusiveness. As a classically-trained intellectual, Yan Fu stood out among his peers by studying the underlying ideas that made the European countries strong. His efforts to seek answers to China's problems from Europe gave China a glimmer of hope in those dire times. Chairman Mao Zedong referred to Yan Fu as an icon of seeking answers from the West. 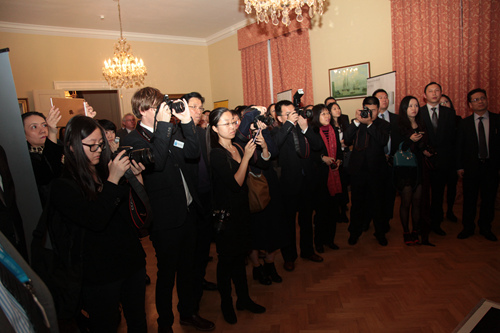 Today for Western countries, the openness and inclusiveness are also relevant when it comes to how to understand China. Is the rise of China an opportunity or a threat? The answer depends on where one stands. On one side there is openness and inclusiveness; on the other side there is hostility and bias. On the side of openness Yan Fu set a good example for us over a century ago. China’s rise is an opportunity some may hesitate to embrace, but will definitely hate to miss. Yan Fu is also remembered for his courage to herald reform. When the Chinese nation's fortune was in its darkest hours, Yan Fu took the initiative to introduce European thinking into China. He spoke out against the outdated feudal system and argued for reform and modernisation. Yan laid the intellectual foundations for the changes that were in desperate need in Chinese society a century ago. President Xi Jinping once said Yan Fu displayed extraordinary vision and courage of a true Chinese pioneer. That vision and courage still inspires us today, in our efforts to reform, to unleash the vigor of the market, to innovate our way forward and to promote the rule of law. The need to reform is universal if we are to spur growth, unravel structural problems that are decades in the making and strive for a fairer society. It’s the same here in this part of the world as well. Finally, Yan Fu is remembered for his commitment to promoting understanding between cultures and civilisations. Aside from being a remarkable thinker, he was an outstanding educator and translator. As a teacher and administrator at naval academy in China, Yan Fu introduced modern teaching theories and practices in his work. Many of his students later played key roles in the course of Chinese history. As a translator, he gave us the golden rules of truthfulness, expressiveness and elegance which still guides the theory and practice of translation in China. Today, we have vast troves of Western books translated into Chinese but there is a deficit in the other direction. It is my hope that we can have more master translators and communicators in the UK and in the West to introduce Chinese culture, Chinese thinking and Chinese Dream to the public here in a truthful, expressive and elegant way. That will do great service to the understanding of China, especially modern China, both in the UK and beyond. China in the 21st century has far better fortunes that have been hard fought and earned. We are now working for the realization of ‘Chinese Dream’ of national rejuvenation. China-UK relations are very different from what they were in Yan Fu's time too. Today it is a relationship of partners built on equality and mutual benefit. In such a context I consider myself a much more fortunate diplomat than my predecessor Minister Guo Songtao. Instead of one Yan Fu, we have thousands of them well versed in both cultures and working hard for the betterment of our relations in business, education, culture, science and technology and many other fields. As Yan Fu embodied in his translated version of Evolution and Ethics: "The world gets better as it moves forward". To conclude, I wish to congratulate the Greenwich Foundation for the Old Royal Naval College and the Yan Fu Foundation for making this exhibition possible. While we are commemorating the accomplishments of Yan Fu, I believe we should also salute our contemporary Yan Fu’s for their efforts in delivering a better tomorrow for East-West ties and a brighter future for China-UK relations.